Soybean are used in a wide variety of foods for humans and animals, as well as for industrial and consumer products such as building materials, lubricants and other household items. Learn about those soy-based options in the Soy Products Guide. 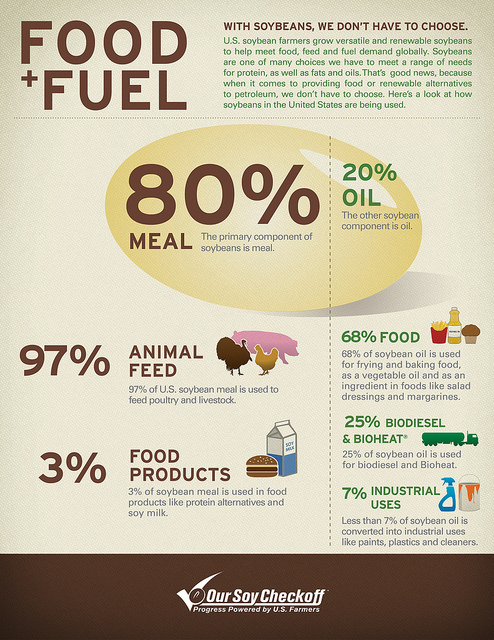 Soybean oil used for industrial purposes accounts for 7 percent of soybean oil used in the U.S. This oil is converted into products like paints, plastics and cleaners. Biodiesel makes up 25 percent of soybean oil used in the U.S. Biodiesel is a renewable substitute for petroleum diesel made from soybean oil. The fuel reduces greenhouse gas emissions, increases energy efficiency and provides a 15 percent price support for soybeans. Learn more about biodiesel here.